Sunday June 29th 1924 Hattie to S S and church. Rob took me out to Hedges. Nice visit. Saw Dorothy Crosby at Robert Mc---. I walked home. The folks up at the other house. Ott & Fannie here a little while. We rode after supper. Reports of terrible storm at Des Moines, at Peoria, and in Ohio. The river high here. Monday June 30th 1924 I rode to town with the girls when they went to the other place. Did errands and rode home with Ott & Fannie. Mr Hedges brought my machine home. Mr Stanfield came to fix my furniture. The Whetstones are taking things away. The old desk down to Otts. We rode after supper. The river is very high. Tuesday June 1st 1924 My rug came over to Fannies in AM. I had the transfer men take my furniture down in afternoon. We rode in the evening. Had Ott & Fannie. Was up at The Whetstones house and Coralville. Wednesday June 2nd 1924 I took some things down to my room. Then helped the girls here. Rode to town with them after dinner. Met Tishie. We went to her house. I got home before the rest. Letter from Lydia. 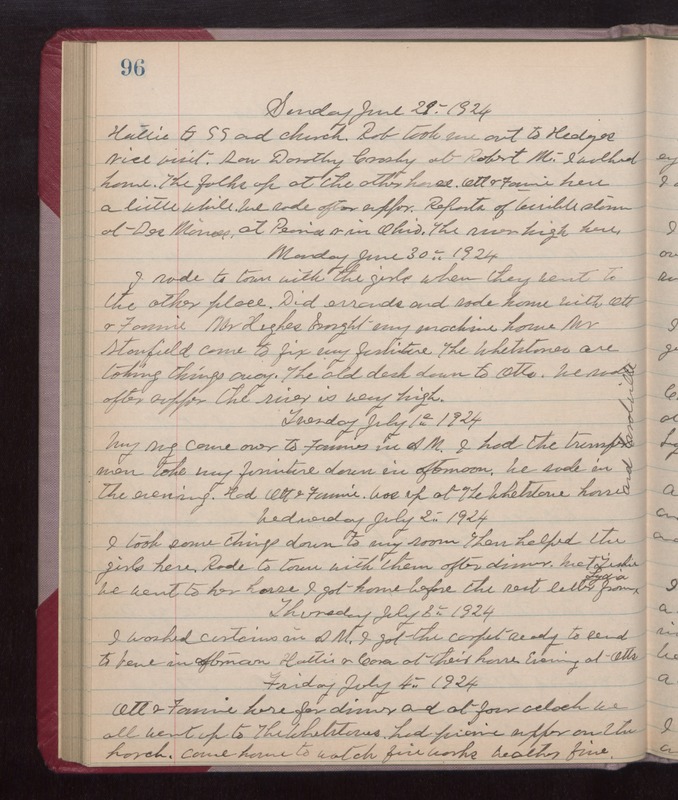 Thursday June 3rd 1924 I washed curtains in AM. I got the carpet ready to send to Vene in afternoon. Hattie & Cora at their home. Evening at Otts. Friday June 4th 1924 Ott & Fannie here for dinner and at four oclock we all went up to The Whetstones. Had picnic supper on the porch. Came home to watch fire works. weather fine.